Sharing my mom’s secret to the softest and fluffiest piroshki (Russian hand pies) with simple beef and rice filling, but you can fill yours with whatever your heart desires. It’s official!! Dates are set. Tickets are purchased! We’re going to Mongolia next month!! And by we, I mean Grant and I. Unfortunately, it’s a busy season for my husband at the ranch and he won’t be able to join us this time. But I can’t wait to be in my childhood home and be spoiled with mom’s cooking! I miss her cooking so much. If you’ve been around for a little bit, you’ve probably seen a few of her recipes already. But here’s another one. 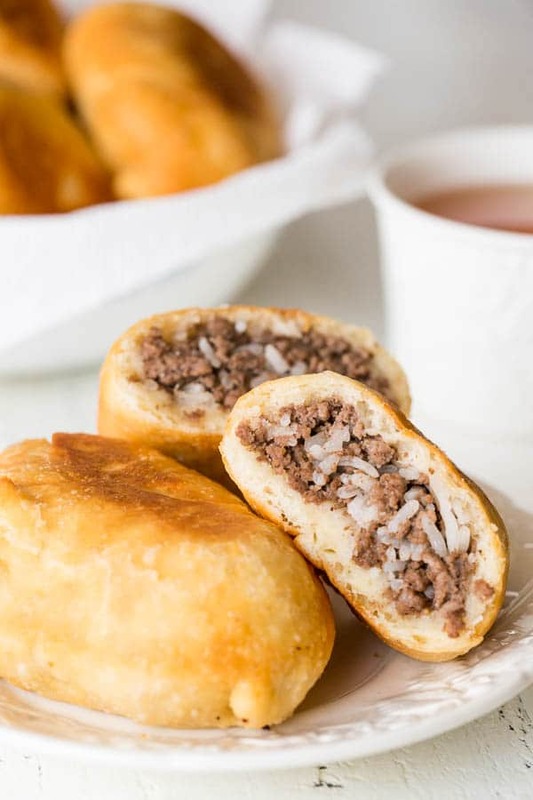 These Russian piroshki (or pirojki, or pirozhiki, however you wanna spell it) are stuffed with simple meat and rice mixture and fried till golden brown perfection! This’s my favorite comfort food straight from my childhood. It all starts with yeast leavened dough, which is so dreamy soft and fluffy. It’s truly the best part! I’ll share my mom’s secret for that super soft dough in a minute. 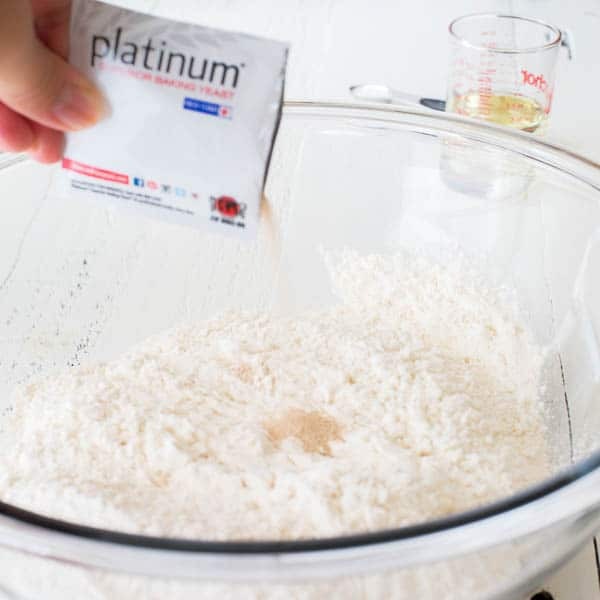 But first, let me share a word about my trusted Red Start Platinum yeast. As you know, this’s my second recipe in partnership with Red Star Yeast, but it’s definitely not the only recipe I use it in. I’m seriously a huge fan of their products, mostly because they consistently deliver amazing results. Ok, now the secret to the softest piroshki dough is vegetable oil! That’s it. Stirring in some vegetable (or canola) oil right into the dough yields the softest and most tender dough you’ll ever bite into. Now, you can fill the dough with whatever filling your heart desires, mashed potatoes, cabbage and meat, all meat, or in this case, meat and rice. Anything works here! You don’t need a thermometer to fry these savory hand pies. Simply drop the end of a wooden spoon into heated oil, and if it’s bubbling up around the wood, that means the oil is ready for frying! Drop those pretty little nuggets into the oil and watch them turn beautiful golden brown. Since we’re using pre-cooked filling, it won’t take long. By the way, these meat hand pies are perfect portable meal for picnics, potlucks and all the summer activities! Hope you’ll give it a try. 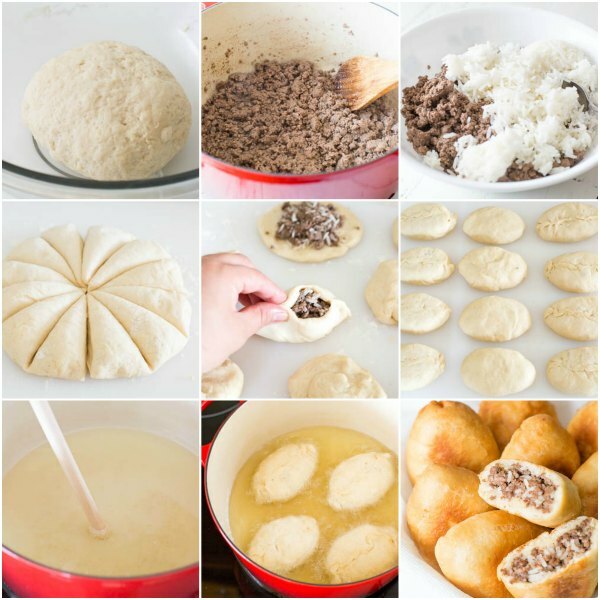 I’m sharing my mom’s secret to the softest and fluffiest piroshki (Russian hand pies) with simple beef and rice filling, but you can fill yours with whatever your heart desires. To make the dough, in a large mixing bowl, combine flour, yeast and salt. Meanwhile, prepare the filling. Heat olive oil in a large skillet or dutch oven over medium high heat. Add the meat, garlic and salt. Cook the meat, breaking it apart with a wooden spoon, until cooked through. Transfer into a large bowl and mix it with rice. Once the dough is doubled in size, take it out onto a lightly floured surface and knead into a smooth ball, 1-2 minutes. Lightly flatten the dough ball into a disk, and divide into 12 equal parts as you slice a pizza. Roll each piece into a smooth ball. 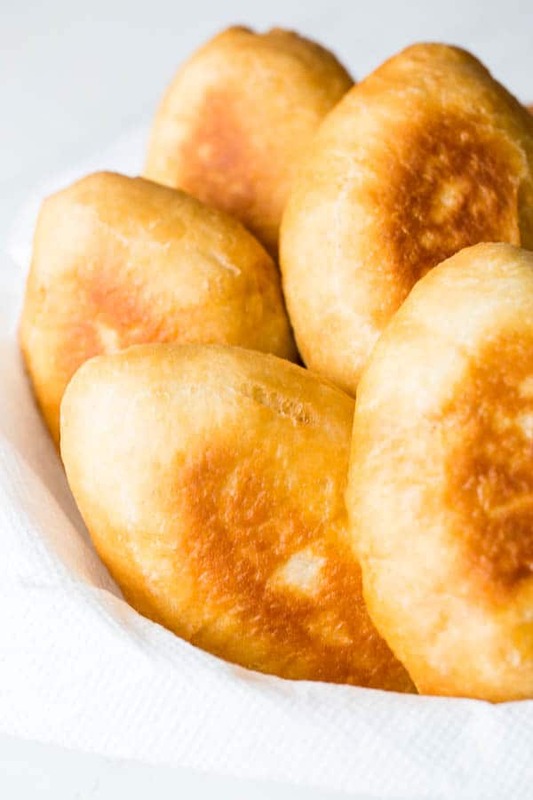 To cook the hand pies, drop 4 hand pies in the hot oil and cook until golden brown, 3-4 minutes. Flip and cook until it’s nice and golden. Remove into a bowl, lined with paper towel to absorb excess oil. Continue with the remaining batch. Serve piroshki warm or at room temperature. What a great surprise. So glad you were able to impress everyone. Thank you for your feedback, James! Hello. 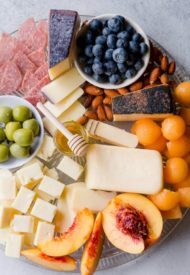 I’m planning on trying this recipe for a potluck at work and was wondering a couple of things. Will they stay fresh from the night before to the potluck the next day and also do you suggest any sort of dip with these or just eat them as is. Thanks for the recipe, I’ve been dying to make Piroshki ever since I read about them in a story. Hi, Zach. Though these piroshki reheat well, I personally prefer them fresh. And generally, piroshki aren’t served with any dips. They’re great as is. Hope you’ll give it a try, and let us know how they turned out, if you do. Hi Shinee, these hand pies sound amazing! I would like to try them this Holiday dinner. We will be visiting my nephew and his beautiful wife for an early Christmas dinner and I want to take them as a dish. How long can the Piroshki wait to be fried after filling them? i was hoping to serve them warm and fresh, so I would like to do the prep at home and just fry them at my nephews house? Hi, Nissa. So, the dough is pretty sticky. And I recommend cooking them as soon as you fill and shape them. Or they’ll stick to the pan and will be hard to remove them without mangling them. My suggestion is to fry them and put them in a bowl lined with paper towel, cover with a lid and wrap in a towel to keep it insulated. Hope this helps. So happy you enjoy my recipes, Jaylin. Thank you for your comment. Can these be baked instead of frying? Hi, Mari. Yes, you can bake it. I would say about 25-30 minutes at 350°F. Thanks for this recipe. In Japan we had these in a Russian restaurant. 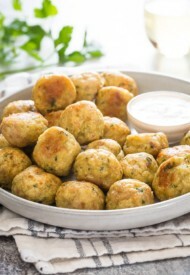 They used ground veal with onions and chopped hard boiled eggs, then ate them dipping in hot mustard between bites. Hi, Pat. Sounds like a delicious filling! And the dipping sauce sounds awesome! 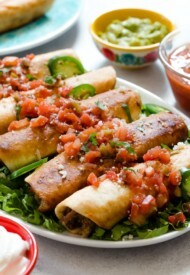 Hope you’ll give this a try and experiment with different fillings. I tried piroshki in Seattle on our 5th anniversary trip. LOVED them. I have a Ukrainian exchange student in my AP biology class and we talked about piroshki’s a couple of times. I think am going to make these the morning of their AP exam so they have some breakfast before they start! I liked the cabbage and beef ones but I’m not sure my students would like that so much so I think I may do half of them potato and breakfast sausage and the other half with a fruit filling. Hi, Will! Potato and sausage piroshki sounds fantastic. I bet it’ll be a hit. I’ll be trying that too. Thanks for the idea. And hope your students will love it too. Your students are lucky to have you! 🙂 Thanks for the comment. Can these be frozen before frying and just fry when needed or freeze after fried? Hi, Tanya! I recommend freezing them after you fried them. It’s dangerous to fry frozen stuff, as hot oil will splatter. However, you can freeze uncooked pirojki and bake them in the oven. Hope this helps. Will definetly try your piroshki recipe which I happened to stumble upon. Thank you for sharing !!!! Hope you’ll enjoy them, Rick. Thanks for stopping by! Is the dough recipe good for fruit & such handpies? Hi, Mollie. The dough is pretty plain, so I think you can use it for sweet fillings too. Let me know if you give it a try. Can I use instant yeast that comes in one packet? TY. Hi, Mike. Yes, you can use instant yeast. Can these be fozen? Would love to freeze and have for a quick meal this winter. Hi, Mary. Yes, you can freeze cooked piroshki. When you reheat them, I suggest baking it. I find that the dough gets rubbery, when I microwave them. Hope you’ll enjoy! How long are they able to stay frozen for? And how long should I bake them for? Hi, Kayden. If you wrap them well and store in airtight container, they should be good for 1-2 months. Bake at 350°F for about 20 minutes, or so, until they are heated through. My mom made these all the time growing up, she has sinse passed and we haven’t had a recipe. Excited to try these! Coming across this brought back lots of good memories thanks! Hi, Jessica! I’m so happy to hear that these piroshki brought good memories of your childhood. I hope it’s similar to what your mom used to make. Let me know if you give it a try. definitely one of the better dough recipes out there. Instead of 1/2 t salt i added 1 tsp, which was great. Next time will try 1 1/4. The only issue was the consistency of the dough. I had to add more water for it to come together, which was fine, but for some reason the dough was super hard to roll into balls, even after it rested. It wouldn’t come together. In the end it doesn’t matter, we rolled them out flat no problem, but i’m just curious why it’s this way. Hi, Marina! I’m happy to hear you liked the dough. As for the consistency, I find that weather affects the amount of liquid the dough requires. But I’m not sure I understand the issue you had described. So when you roll the dough between your hands, it won’t shape into a smooth ball? Was the dough nice and soft after some time to raise? My only thought is maybe the dough was a bit on harder side? I’d advise to make the dough a bit softer next time. I have tried many of your recipes, and I must say, I’m very delighted, they all turned out real good. Thanks!! Aww, that’s so great to hear, Ana! Thanks so much for your sweet comment and for trying my recipes. Tried and true family recipe are the best! Yes, you can, Angela. Bake at 350°F for 20-25 minutes.